Microsoft Ignite | The Tour – Join us for our free flagship deep technical training conference in Sydney! 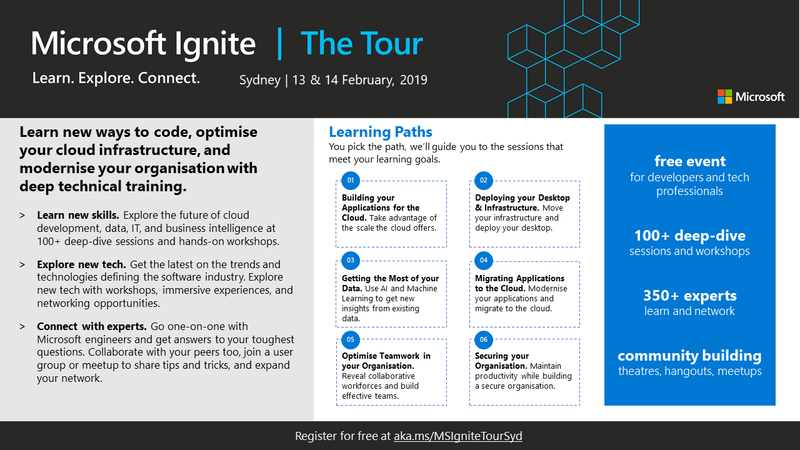 We’re excited to announce Microsoft Ignite | The Tour, a free technical training event for developers and tech professionals, is coming to Sydney on 13th & 14th February, 2019. Our top engineers are hitting the road to bring you two days of deep dive sessions, hands-on skill-building, and networking opportunities. Don’t wait – secure your spot today. This event will be packed with technical content, brought to you by the experts who build and run Microsoft’s cloud services. Explore the latest developer tools and cloud technologies and learn how to put your skills to work in new areas. Connect with our community to gain practical insights and best practices on the future of cloud development, data, IT, and business intelligence. Build your best conference experience with custom learning paths covering the latest in intelligent data processing – including Power BI, IoT Hub and Microsoft 365 – collaborative dev tools like Visual Studio Live Share, and ways to build and deploy secure, scalable infrastructure applications on Azure. You pick the path, we’ll guide you to the sessions that meet your learning goals. Then customise your conference even further – pick up new skills with elective sessions that complement your path. Getting the most of your Data – Learn how to use AI and Machine Learning to gain new understanding using existing data within your organisation. Migrating Applications to the Cloud – Learn what it takes to modernise your applications and prepare them for successful migration to the cloud. Optimise Teamwork in your Organisation – Reveal the collaborative workforce within your business and learn how to build effective teams. Securing your Organisation – Build a secure organisation without compromising the productivity of your business. Whether you’re developing innovative apps or delivering optimised solutions, Microsoft Ignite | The Tour will help you evolve your skills, deepen your expertise, and prepare you to face new challenges.